Find hotel near Museum Of Contemporary Ar .. This beautiful museum features a collection of arts, woods, paints, structures and more. The mono color tone on the walls of the museum, with these colorful exhibits gives the MOCA an appealing appearance. Art lovers would probably visit it one more time. 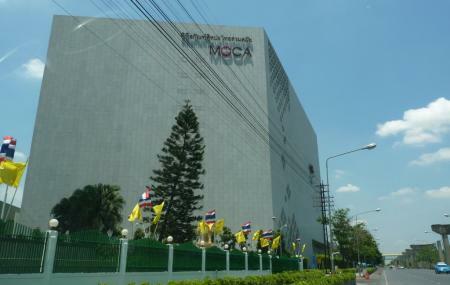 The well set up museum simply makes for a wonderful visit and is highly recommended when in Bangkok. Museum of Contemporary Art makes for a great family outing as well. The museum is free for seniors, disabled visitors, monks, and novices as well. How popular is Museum Of Contemporary Art? People normally club together Bangkok Float Center and Ananta Samakhom Throne Hall while planning their visit to Museum Of Contemporary Art. Oh.... This is an ....hard to say. They declare that this is a contemporary museum but this museum does not explore the comprehensive contemporary art all over the world because it’s simply this is a private museum owned by one business man.the collection is rely on his taste.of course this museum is playing a key role for collecting national artists of Thailand but mainly the collection is reflected on his preference. I really love this spot because I can enjoy the most sophisticated art works in Bangkok. I’ll come back here again. The Museum of Contemporary Art is from 2012. It is a private museum housed in a large building. There is no double pricing. Same price for a Thai and a foreigner. If you are more than 60, you can enter for free. Not only Thais, but also foreigners. The price for a regular ticket is TB 250. Obviously, most of the items on display in this museum are from Thailand, but on the fifth floor there is an interesting collection of foreign items. Next to all items on display is a label with information in Thai and in English. You are allowed to use a camera inside the museum, but you cannot use a flash. There is one exception: you are not allowed to take pictures inside the special Robert Green collection on the fifth floor. There is a coffee shop on the ground floor. There is a car park in the basement. The staff are friendly and helpful. If you are interested in contemporary art, this place is definitely worth a visit. Surprisingly beautiful (and modern) structure that houses mostly modern and some traditional art. Peacefully quiet—not many locals seem aware it exists. The art is fascinating—a modern reinterpreting traditional Thai aesthetic forms. Lovely reprieve from the hot chaos of the city.